We can engrave on a range of materials, including metal, glass, wood, stone and plastic. L Squared are based in Shefford, Bedfordshire and specialise in all forms of sub-contract laser engraving, etching and marking, for all markets including medical, promotional and engineering applications. 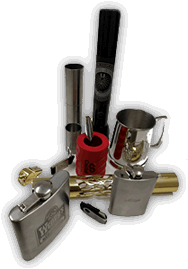 Let us help you create outstanding engraved promotional products for you customers. We can work with most materials and products. Our high-tech rotary device engraves with a resolution of 0.01 of a degree, ideal for intricate engineering work, logos on promotional items amd much more. Our subcontracting service will reduce your costs and diminishes the expense of buying and maintaining your own machine. We have the largest and youngest fleet of marking machines in the industry, making us well placed to help you produce professional products at competitive prices with short turnaround times. We are an ISO9001/2008 certified company, giving you peace of mind that our quality is repeatable and of the highest standard. Our state-of-the-art lasers can be used to engrave and mark a wide variety of components from industrial machinery and aerospace parts, through to personal items such as iPads, key-rings and gifts. Over the years we have built up an extensive portfolio, working with a wide variety of industries. With years of experience, we are ideally placed to guide you, offering a full service from design and artwork through to engineering. We operate a ‘no job too small’ policy and are set up to support one-off jobs, as well as production runs of 50,000 plus working with you, on time and to budget. Always happy to help. So do you need help with your engraving?